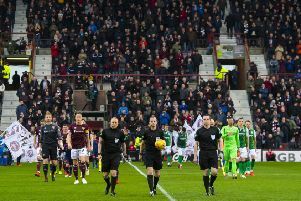 Gordon Smith holds a unique place in British football, having won the league championship with three different clubs – all outwith the Old Firm – and of having played in the European club for each of them, Hibs, Hearts and Dundee. Born in Edinburgh, Smith grew up an exiled Hearts supporter in Montrose and had both Capital clubs after him after scoring a hat-trick for a Dundee junior select against a Hearts-Hibs X1. He was persuaded to sign for Hibs in April 1941 for £10 and on his debut he scored a hat-trick against Hearts at Tynecastle. By the end of the Second World War he was an internationalist and had a century of goals in the Scottish Southern League to his credit. Smith, said to be as skilful as Stanley Matthews and as good a goalscorer as Tom Finney, went on to play 674 games for Hibs and scored 364 goals, including 17 hat-tricks and five in one match against Third Lanark. It was a phenomenal record for any player, never mind a winger who was regarded as the outstanding member of the Famous Five. In all, Smith won five championship medals, three with Hibs and one each with Hearts and Dundee. In 1962 with the Tayside club he became the first British player to have played in the semi-finals of the European Cup, having first done so with Hibs seven years earlier. He was also part of the Hibs team which lost the 1947 Scottish Cup final to Aberdeen, but won the League Cup with Hearts in 1959, beating Third Lanark 2-1 in the final. He also played 18 times for Scotland, skippering his country on a successful tour of Europe in 1955 having previously felt he was not considered a first choice for the national team. Smith also gained nine caps for the Scottish League before retiring after 23 years in top-grade football to live quietly in North Berwick, where he died in August 2004.